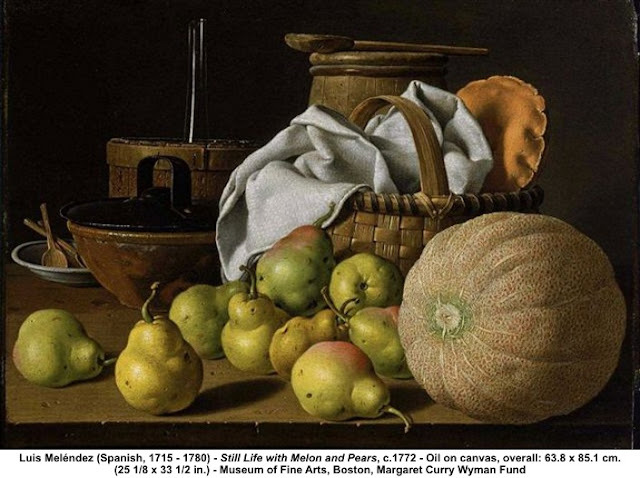 According to Gretchen A. Hirschauer and Catherine A. Metzger in Louis Meléndez, Master of the Spanish Still Life (Yale University Press, 2009) this painting combines several of Meléndez favourite props. The wine cooler appears in at least ten other compositions, the large spoon, the basket, the kitchen cloth and the ceramic bowl with the iron lid all appear elsewhere. Apparently only the group of three spoons in the plate on the left is unique. Even the melon turns up again in Still Life with Melon, Jug, and Bread. But what a magnificent melon! The inclusion of this painting here is for no other reason than I thought some sort of illustration was long over due. This month there is no particular theme, just a collection of interesting bits and pieces. In February the Australian Government published Foodmap:An analysis of the Australian food supply chain. The aim of this study is 'to identify the scope for improved performance of the food industry in the face of changes in consumer preferences, pressures from the global food market and the strategic responses of major food sector participants'. The report, full of graphs and tables, makes for interesting if not inspirational reading. It will perhaps come as no surprise to learn that supermarkets account for 63% of household food expenditure of which 80% is controlled by Coles and Woolworths. Nor is it any surprise that the private label brands share of grocery categories has increased dramatically since 2002 and most of the brands we buy in the supermarket are foreign owned. Pasta and margarine are the only two categories where the brands are more than 70% Australian owned, and you can add to them bread, rice and smallgoods for those categories more than 50% Australian owned. Biscuits, canned fruit, cheese, canned fish, fresh dairy, frozen vegetables, milk and sugar are all less than 10% Australian owned. The good news is that the report concludes that Australia has relatively high food security. That is food security,as defined by the FAO - 'a situation that exists when all people, at all times, have physical, social and economic access to significant, safe and nutritious food that meets their dietary needs and food preferences for an active and healthy life'. So the devil is in the detail somewhere - but perhaps not in this report. Because I like my food with a bit of history here are two links to the past - How tea was picked in the late nineteenth century here and Salvador Dali and friends dining at a 'Night in a Surrealist Forest' here. There is also another new journal, the 'International Journal of Gastronomy and Food Science', the first issue of which includes an article by our very own Neil Perry on dry aging beef. This isn't exactly light, bedtime reading but might be worth keeping an eye on in future. And another new and rather more scientific journal is 'Flavour' which you can look at here. 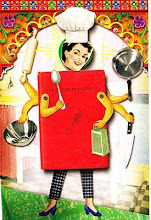 On the subject of reading, Claudia Roden has a new book out on the food of Spain - see here. You can read a recent interview here and a much longer and very interesting piece by Jane Kramer for The New Yorker here. and finally this on what might be the newest trend in fast food. And before I forget, the 19th Symposium of Australian Gastronomy will be held in Sydney over Easter 2013 (29th March to 1st April) and the theme will be 'The Welcoming Table'.